Here we are going to discuss on why Magento Development company have switched over to Magento and what are the 6 cool features in Magento 2. Magento 2 is flooding everywhere as people are talking about it and many are in a dilemma on whether they should be moving to Magento 2 or to stay with Magento 1. Keep reading this post to find the reasons to choose Magento 2. Performance is improved by the introduction of a separate database for order processing, reduced amounts of code, increased browser rendering, better image compression and static content caching. Indexing is the way Magento system transforms merchant data, such as catalog data, prices, users, stores, etc. by creating index tables and keeping them updated to boost the query speed and improve the performance of your online store. The new default indexers in Magento 2 include all of the functionality as in the previous enterprise versions. The difference is that they come with more efficient updates and have been improved to speed up the query performance. To verify and optimize system performance, one can create test environments and test code changes by using Magento 2’s new set of performance test scripts. Varnish : To help reducing server load and speed up the page load, Magento 2 is integrated with Varnish Cache the leading HTTP accelerator technology responsible for caching common requests. Full page caching : This means all content from a static page is cached, therefore, increasing performance and significantly reducing the server load. Multiple admin users : With Magento 2, multiple admin users can create and edit products without the fear of data conflicts. The new Admin Panel’s visual appeal is immediate – it is now “touch-friendly”. Product creation is a lot more straightforward; table views can be configured/customised & saved and they include in-line editing. Product and Categories management menu is highly adaptable and the access controls can be customized for the users. Adding new details to the system such as products and categories and promotion content is quicker and easier. The blank theme without specific customizations allows developers to easily start theme development adding own features and customizations. The magento 2 platform brings a new default theme, called “Luma”, which is really an eye-catching theme that has some substantial changes compared to previous version – Madison Island theme. The new theme includes tiles structure, typography, fully responsive images and better performance. These are delivered by a wide range of infrastructure innovations: a new framework library, better security, an integrated & automated testing framework, better module management and application of newer technologies (HTML5 & CSS3). Better scalability is yielded by the separation of databases for checkout, orders & catalogs and other optimizations which mean that catalog sizes and overall website capacity are increased. Magento 2 platform comes with new structures which inculcate a unique proportion of flexibility. With a perfect combination of high code coupling incorporated within component oriented architecture allows you to connect with a variety of components including customers, CMS, checkout, catalog, sales and a lot more. That means you are free to enable or disable the components as per your fluctuating requirements, keeping the code base clean and de-tangled! but once work with 2.x developers can understand that it is in fact lot more structured and easier than the Magento 1.x series. Even most of the working files of Magento 1.x have been reorganized in a distinct way. In the 2.x series, everything is now moved under “app” file, except for config.xml where you will need to register your specific module. Next, Templates; layouts and JS or CSS files are now placed under the file of each module. Again, there is now only one code pool for all core and custom modules in Magento 2.x series. Using the enhanced API’s, Magento 2 simplifies the process of integration with external systems and makes it possible to return the objects (order, customer, etc...) and associated data in a single call. 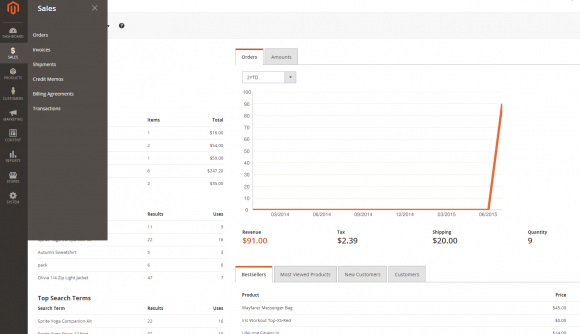 The way of Magento 2 optimizes and modifies the checkout process is very impressive. (e.g. single click account creation prompted at the order confirmation page). Validation happens field by field (synchronously). Magento 2 not only simplifies all the checkout processes into a speedy treat, it also introduces an approach to the consumer that they really want to purchase the product, hence removing the hassle of connecting dots for making a checkout for good. To make the checkout process more transparent the shipping rates shown instantly after the compulsory fields have been filled, and there is no need for entering your billing address unless you are payment ready for the checkout option. The checkout is absolutely Zip code friendly and customers who live in places with multiple zip code cities then it can be corrected easily unlike in the past versions. Magento 2 doesn’t use Bootstrap but uses its own LESS and CSS in the theme core. It has the publisher to find and publish CSS together with other view static files placed under the pub/ directory. The publisher also supports pre-processing of files being published by using some pre-processors. 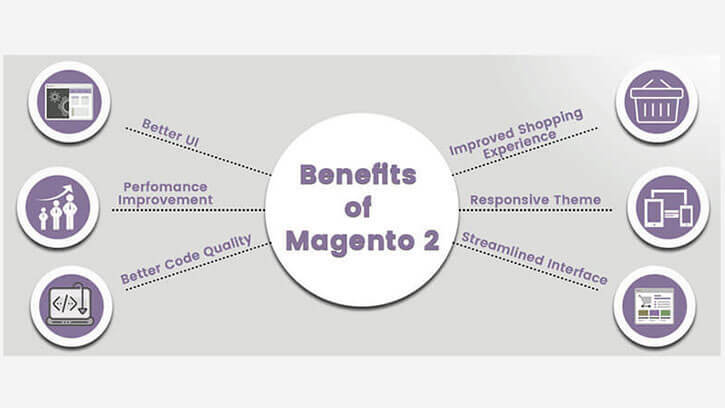 The Key advantages of Magento 2 is using LESS helps users to custom theme faster and easier. LESS pre-processor & CSS URL resolver help enhance performance, speed up page load, and make the system more friendly with the search engine. Magento 2 contains the information regarding versioning policies and compatibility of upgrades with current versions. This allows developers to anticipate upcoming changes and consider them in their customizations. It also includes a standalone installer, which supports fast and smart installations with preliminary checks of the installation environment. Magento 2 is also greatly adapted for extension installations and upgrading procedures. The features of Magento 2 are really impressing and give a lot to the extensibility and universality of the platform.